The 2000s Blue Pride: State Champs! “I’m one of the three coaches, I was the assistant coach for that season. How do you explain it? It’s a miracle.” Mike Petelka spoke with an almost childlike speed and excitement as he described the events that took place five years ago. 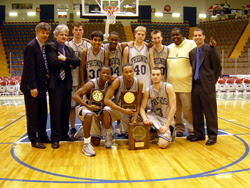 That season—the one still talked about as legend in the halls of Brooklyn Friends—was the 2003 basketball season in which Head Coach Vlad Malukoff’s boys varsity team won the state championship. “We had a slow start,” Coach Mike remembered. “We lost our opening game to a school that caught us off guard, but then we just settled into an incredible winning ride, ultimately earning a 25-4 record. Stories like this are what prompted Athletic Director David Gardella and Andy Cohen, video teacher and filmmaker, to put together a documentary film on the 2003 state championship team. “David told me he wanted to interview the players upon their graduation from college,” said Andy, himself a coach of softball. “It was a miraculous David and Goliath story to win a state championship with nine players coming from a tiny student body. The players and coaches were a diverse group that came together to become something greater than their parts.” David and Andy are putting the finishing touches on the film, titled Blue Pride: State Champs! and plan to screen it as part of the ongoing celebrations of the Upper School’s centennial. Ryan Fischer Werner looks back on the 2003 BFS season as the standard he has tried to live up to throughout college, especially in terms of team chemistry. “We had a group of guys who wanted to win so badly we did what we had to do.” He still keeps in periodic touch with his old teammates and coaches. As for the BFS community at large, Ryan recalled that season as a paradigm shift in their attitude toward team sports at BFS, and he credits 2003 Head Coach Vlad Malukoff, assistant coaches Mike Petelka and Maurice Washington, and AD David Gardella for that shift. He recalled the entire school being caught up in that season, with a leap in attendance at games and many driving all the way to Glen Falls to watch the state championship. Alap Vora concurs with Chad’s recollection of the season’s impact on the community. “I remember it vividly. We really got a lot of attention from everyone at the school. We always had a good crowd; we had teachers coming to the games who’d never been before. There was a lot of buzz in the papers. It put BFS athletics in the limelight for the first time; people definitely knew who we were.” Alap considers himself a lifelong basketball aficionado but of the armchair variety, considering himself probably the weakest player on the 2003 team. “The team was already strong when I joined. I wanted to be a part of it, but it was really Kyle Neptune who convinced me and said, ‘Look, you just really need to stop whining and suit up.” Alap and Kyle had been best friends since childhood. “I was the least talented and he was probably the best player, but we always stayed good friends.” They still talk nearly every day. “I tell you, I’m not one for these mystical explanations, but there was this feeling I had that I experienced only one other time coaching—that whatever we did wrong, we’d get out of it somehow, that these guys had a spirit to win the game no matter what. But that feeling was very brief. If you shoot 26 foul shots and you make 8, that’s awful. That’s what we did in one of the games. For most of the year I thought we played below our ability. We made it to the playoffs though, and had to go up first against Poly Prep, a sports powerhouse. They had a 6’ 10” kid, a junior, Joakim Noah, you know him? He went on to lead the University of Florida to the national championships in the NCAA and he now plays for the Chicago Bulls. Poly beat us by 20 points, 71-51 in a regular season tournament game. If you asked me then, what do you think? I’d have said we’re not really playing up to our potential. See, the year before had been more gratifying, and I thought we hadn’t really built on that. Now comes the big change. The next game we played we won, which put us into the league tournament. We had lost to Poly Prep on a Friday. We then beat Packer in the ACIS finals the next Wednesday—we ran them out of the gym. Beat ‘em by like 25 points; we dominated them. The next day we played Collegiate. This is like the Ivy League and we had an inferiority complex in comparison to them. We beat Collegiate. We’re seeded 5th and Collegiate is 4th so they get the home court advantage, but we beat them by like 10 points. Our next game is against Poly Prep: we’re going back to the lion’s den to play them on their home court. They already had a whole room set up for their post game celebration, everyone was sure they’d win. We beat them by 7 points. Chad Levy and Kyle Neptune were the team captains, and Edson Elcock, he was more of a soccer player, was the point guard. Every time we had a time out, Chad Levy would say, “Let’s go out and have fun.” He was like my good luck charm. He had real leadership skills. We knew Poly Prep was going to pile onto Kyle Neptune because he’s our best shooter, so someone else will have to shoot. So Chad stepped it up and started taking shots, and making them. As a coach I did two things, which is not brilliant coaching: for Noah, you got a guy 6’ 10”. So you front him and make them lob it over your head. They had a lot of good guys. The next tallest guy was 6’ 4”. I told Kyle not to guard him, just stay in the middle and whenever the ball goes to Noah to run and help the defender. It worked. This left their 6’4” kid totally confused when he got the ball and we took it away from him. Poly was the best team we played. We had one day off, then we had to play Horace Mann, another powerhouse. But our guys in just one week turned from being disappointed to being overwhelmed at what they were able to do. Not that it was a miracle, but I saw an attitude change in them, a real determination that no matter what happened they were going to win. We blew Horace Mann out in the third quarter. It was like 75-67. And that’s what got us to Glens Falls. At the last game there it was a really weird feeling. With 4 minutes to go, a little less, Kyle has his hands up, moves a bit, and they called technical foul on him. So Kyle fouls out. Buffalo City Honors ties the game up with a 3-point shot at just two seconds to go. If you’re a betting man, you say we’re going to lose. But our guys stepped up.